In the mid-1970s, a political group made up of members of the West African diaspora in Paris decided to turn their back on factory work, to become apprentices with French farmers and to found the cooperative "Somankidi Coura" in Mali. The Mauritanian director Sidney Sokhona made his feature Safrana ou le droit à la parole (Safrana or Freedom of Speech) (1977) about them. It is a collective, fictional work in which the actual protagonists themselves play central roles. One of the leading figures is the photographer Bouba Touré whose political activity also included film. A generation later, Raphaël Grisey - in his video piece Cooperative (2008) - once again turned to this history of self empowerment and image production. Grisey's ongoing collaboration with Bouba Touré and the cooperative Somankidi Coura also brought about Bouba Touré's short Bouba Touré, 58 rue Trousseau, 75011 Paris, France in which the director transforms his apartment into a living archive. Sidney Sokhona's oeuvre also includes the feature Nationalité: Immigré (1976), which already starred Bouba Touré in a leading role. Sokhona introduced a new tone into African diaspora cinema: powerfully self-confident, explicitly political and radically critical against all forms of discrimantion against immigrants - including the paternalism often felt from the French Left. 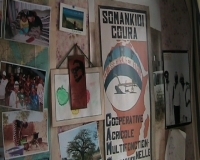 Sokhonas films were the object of sveeral in-depth discussions in the Cahiers du cinema at the time. No. 285 of the magazine featured an extensive interview with Sidney Sokhona conducted by Serge Daney and Jean-Pierre Oudart, followed by an article by Sokhona reflecting on the contemporary situation of African cinema. The following night, Wed 25th, the discussion will be continued at gallery Savvy Contemporary, Richardstrasse 20, Berlin-Neukölln. Grisey and Touré will bring further material to the screen, including Sokhona's first, docu-fictional take on African migrants' lives in Paris, Nationalité: Immigré (1976). Raphaël Grisey's video works often concern the visible and invisible histories of places and locations. This entails him engaging with terrains that often seem more or less alien to him to begin with, granting both them and himself sufficient time to find a story and a cinematic form. His longer works are usually created in collaboration with the people who live in the places in question or who know their stories. Echoes of oral techniques to transmit memory are combined with vigilant camera work embodying a belief in visual memory and the silent language of things and surfaces. Grisey’s work also deals with the equivalence of different narratives even when they are in conflict with one another and about exchanges of perspectives, which are never quite without danger, as the title of one his most recent works suggests, The exchange of perspectives is a dangerous game (2011). Raphaël Grisey’s most recent work has focused on Brazil. A mãe (2012) is a cinematic portrait of the largest food distribution terminal in South America, the São Paolo central market. It brings together accounts of the people that earn their living there and the gestures of work: delivering, sorting, cutting, loading, carrying and waiting. Afterwards, Grisey will be presenting his current project Remanescentes (working title) as a work-in-progress to be discussed with the audience. This project concerns the "quilombos", Afro-Brazilian communities which originally emerged as a result of resistance against slavery. Since 1988, the Brazilian constitution has granted the "quilombos" the collective right of restitution. Yet what makes a community into a quilombo today? In the fight against land robbery and state repression, an increasing number of muncipalities and districts are discovering their often well-buried Afro-Brazilian history anew. For his "carte blanche", Grisey selected two films from the Arsenal archive that deal with the violent land conflicts in northeast Brazil in the 1960s: Paulo Rufino’s experimental short Lavra dor (1968), as well as Cabra marcado para morrer (BR 1984), Eduardo Coutinho's brave attempt to finish a film twenty years after the military coup of 1964 had aborted it after only one week of shooting. His often quixotically minded endeavour brings to light breaks and continuities in a story of resistance.